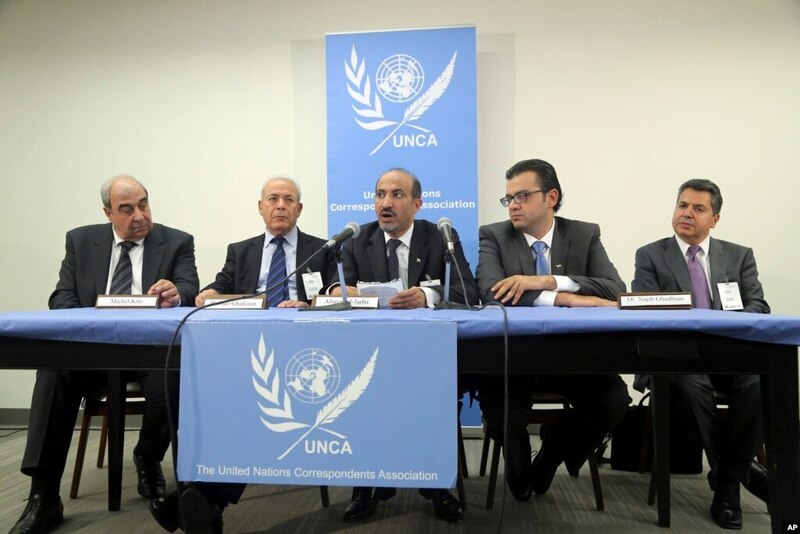 The leader of Syria’s Western-backed opposition group Ahmad Al-Jarba (C) speaks to reporters after an informal Security Council meeting on the situation in Syria, July 26, 2013 at United Nations headquarters. UNITED NATIONS — Leaders of Syria’s main opposition coalition have told the United Nations Security Council they are dedicated to democracy and oppose extremism.British Ambassador Mark Lyall Grant, who convened Friday’s meeting, said a key focus of the talks was finding ways to end Syria’s brutal civil war and to help its victims. Ahmad al-Jarba, the newly elected National Coalition of Syria president, led the Syrian opposition delegation to the meeting. For months, the international community, and most recently the United States and Russia, have been working to get representatives from Syrian President Bashar al-Assad’s government, and the opposition, to meet in Geneva. The goal is to find a political solution to the two-year-old conflict that has killed more than 100,000 people. It would be a follow-up to a meeting a year ago, when participants agreed to what has become known as the Geneva Communiqué, which aims to start a dialogue between the two sides. The communiqué calls for the formation of a transitional government. Western powers and the opposition say the language clearly excludes President Assad and his inner circle from being part of a transitional government. The Assad government and its main ally, Russia, disagree. The issue has been one of the main obstacles to holding what has become known as Geneva II. Russian Ambassador Vitaly Churkin said he encourages the opposition to go to the talks without conditions, which he calls counterproductive. “I regret that there is still an effort – an effort which I saw from leaders of National Coalition and also unfortunately some members of the Security Council – to complicate matters by starting interpreting various provisions of Geneva Communique in advance of the beginning of the negotiations. I mean this is an extremely complex political crisis,” he said. Coalition President al-Jarba told reporters there needs to be more international pressure to force the Assad government to accept a political transition. Al-Jarba said he urges the council to get the Syrian government to accept the Geneva Communiqué and if it refuses, he said the council should impose targeted sanctions. 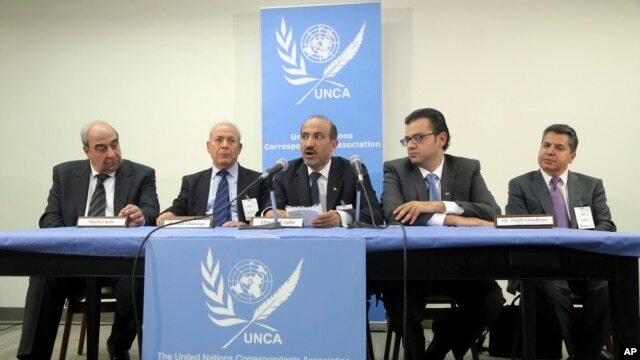 Al-Jarba was clear that the opposition is ready for a negotiated settlement, but only if it is based on the Geneva Communiqué – which still leaves the two sides far apart.